Getting started with Fertility Cleansing is an exciting and important part of a natural fertility program, a foundational step! If you have your products and are ready to go, congratulations on taking this step to support your fertility! Clients often ask me what they can expect while cleansing. In this article, I’ll cover the benefits of cleansing for fertility and how cleansing may affect you. What’s Happening In Your Body During A Cleanse? During a cleanse, your body is working hard to eliminate chemicals that could otherwise affect hormone balance and general health. Dandelion root (Taraxacum officinale) encourages normal bile flow and liver function. Dandelion is actually approved by the German Commission E to treat bile duct problems! Milk Thistle seed (Silybum marianum), by way of supporting liver health, encourages better fat and hormone metabolism and helps rid the body of toxins. While Milk Thistle is incredibly gentle liver support, it’s also powerful and well documented in many journals including Phytotherapy Research. Milk thistle seed extract has long been used for recovery from alcoholic liver disease, and acute and chronic hepatitis in natural medicine. Goldenseal root (Hydrastis canandensis) helps release mucus congestion and stagnation in the uterus, bowels or bladder. Ginger root (Zingiber officinale) improves blood flow, encouraging overall reproductive function. Some people experience no symptoms at all during a cleanse. However, others may experience a short period of minor symptoms. In fact, cleansing symptoms can be a sign the body is responding well to the therapy. Emotional changes/swings: Some people experience minor emotional swings like feelings of anger or sadness while cleansing. However, others feel energized- both physically and mentally. The cleansing experience is as unique as you are! Journal about your feelings or consider a cleansing buddy to share with as you move through this time. Mild fatigue, headache, rash or acne: Some people have a short period of fatigue, mild headaches, skin rash or acne as toxins are moved out of the body. If this happens, drinking more water helps ease symptoms. Try to schedule in downtime to let your body rest and recuperate. Focus on clean eating to keep digestion easy and stress low. Increased elimination: You could experience a temporary increase in urination or bowel movements while fertility cleansing. These symptoms are usually mild, not affecting your day-to-day routine. A Fertility Cleanse is well tolerated. In my experience, it’s much easier for most people to follow in comparison to long cleanses, or strong colon detoxes. Possible cycle shift: Occasionally, women experience a menstrual cycle shift during a cleanse. A cycle shift (period/ovulation coming earlier or later than expected) related to gentle cleansing is rare and temporary. Remember, your liver is in charge of hormone metabolism. Cleansing it may lead to temporary changes as your body adjusts. Some herbs like dong quai or red raspberry we use during the cleanse also mildly affect the uterus. Wherever you are at with your cleanse, stick with it! Know that taking this step is a great way to promote your health and kick off a natural fertility program. Men and women both benefit from fertility cleansing. Partners who cleanse together enhance their intimacy and connection. Cleansing offers numerous benefits, especially when followed with a nutritious diet and lifestyle. While not everyone notices changes, some clients experience easier cycles or less PMS after a cleanse. Others find they have more energy, a better outlook or easier digestion. Ridding the body of toxins can also help clear up the skin and strengthen the immune system. For some people, it leads to easier weight loss if pent-up toxins or stagnation in the body have been holding them back. Hang in there if you’re struggling to get started or to stick with your cleanse. 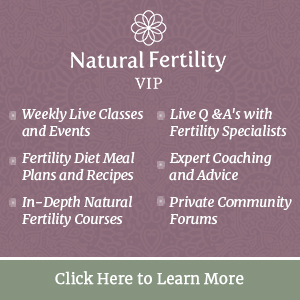 The investment in your fertility health is worth it! Page, L. (2008). Healthy Healing’s Detoxification. Healthy Healing LLC.